Ok, so you better be quick with this one, but I am sure you all will when you see what prize is in store for this amazing competition. Dorothy Perkins are currently running a competition to win a dress every month for a year. Yes ladies, you have heard right!! They have really upped their game with their dresses at the moment and I was lucky enough to receive this white, sheer panel dress from their latest collection. And let me tell you, I am SO impressed. The cut is gorgeous, the material is lovely and I am loving this dressed up tee-style dress. Winning one of their gorgeous dresses every month for a year would be an incredible prize for any fashion forward lady. 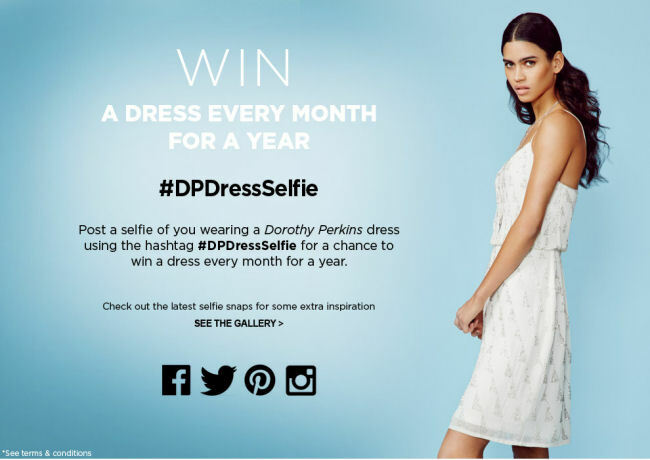 All you have to do to enter, is take a selfie in your fave Dorothy Perkins dress, upload it onto Twitter and Instagram, and use the hashtag: #DPDressSelfie. And I said be quick, because the competition ends in TWO DAYS! That's Tuesday, 1st July. So get taking those selfies girls! wow this dress is soo cute and from DP ? wow ! This dress is amazing,really nice for summer. Love this dress and how you've styled it!